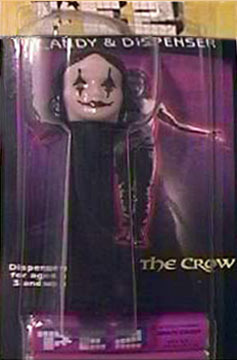 2004 represents the 10th anniversary of the original release of the Crow movie. Several new memorabilia items were released in celebration of the anniversary. Unauthorized Merchandise The following products are counterfeit, fake or otherwise unauthorized, issued without the permission of the proper license or copyright holder(s). This section has just been started, so many more listings will be added, such as posters, photographs and other bogus items. 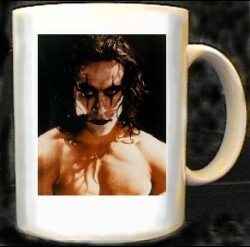 Autographs (It seems just about every Brandon Lee autographed photo offered for sale these days is a fake, with probably over 95% fitting into this catagory. Don't be fooled by "COA's" as many of those are bogus as well. I hope to add a section in the future with expanded information and scans covering fake autographs. Be especially leary of internet dealers who offer autographs for auction with the "bidders identities protected"). Posters (This is a tough area as not only are there reproductions of original posters out there, there are also many different unlicensed Brandon posters as well). Misc. 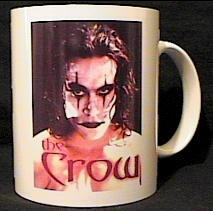 (Key rings; stickers; drinking mugs or Coffee mug with photos of Brandon; 8x10's and other photos).